Biologists studying the endangered California condor have launched a new web site to enlist the help of citizen scientists in research aimed at reducing lead poisoning, the primary threat to condors in the wild. Condor Watch (www.condorwatch.org) asks volunteers to look at photos of condors taken by motion-activated cameras at sites where condors are fed as part of regular management activities. 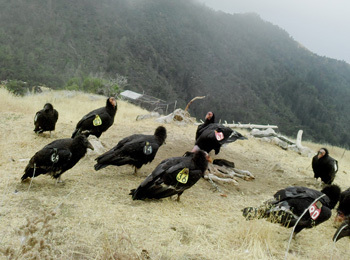 By identifying the tag number of each condor and describing its behavior, citizen scientists will help researchers understand condor social networks and other factors that may be related to lead poisoning. Ultimately, the project will improve the ability of condor biologists to identify birds that are at high risk for poisonings and develop better strategies for ensuring the species' successful recovery in the wild. Launched on April 15, Condor Watch is part of Zooniverse, a collection of of web-based citizen science projects that use the efforts of volunteers to help researchers deal with the flood of data that confronts them. "We have over 100,000 archived photos of condors in the wild, but we don't have the resources to go through them and mine all of the information they could provide. Condor Watch allows us to engage a team of citizen scientists to tap into this wealth of information," said Myra Finkelstein, an adjunct professor of environmental toxicology at the University of California, Santa Cruz. Finkelstein is the lead investigator of an ongoing research program on condors and lead poisoning. Her research has shown that lead-based ammunition is the main source of lead poisoning in California condors, which are scavengers and ingest bullet fragments when they feed on the carcasses of animals shot with lead ammunition. Without a solution to the problem of lead poisoning, the condor population can only be sustained through intensive and costly management efforts. Since 1982, when only 22 condors remained in the wild, a captive breeding program has brought the total population up to more than 400 birds. Condors are regularly released in several areas in California and Arizona and are also frequently recaptured for medical care, including chelation treatment for lead poisoning. The feeding stations where the photos were taken allow scientists to monitor the birds and recapture them when needed. "Condors are unique in that they are so closely managed," Finkelstein said. "One of the fun things about Condor Watch is that when you identify a bird it gives you a little biography about that individual." 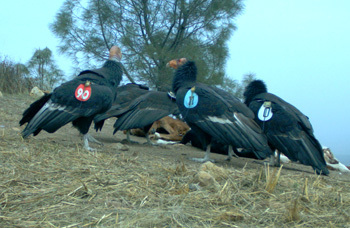 Condor Watch is launching with 175,000 archived photos taken at feeding stations in California. The researchers partnered with Zooniverse to build the web site, which includes information about condors and the science behind the project, as well as guidelines for citizen scientists. Other researchers involved in the project include Donald Smith at UC Santa Cruz; Daniel Doak and Alexandra Rose at the University of Colorado, Boulder; Vickie Bakker at Montana State University; Carolyn Kurle at UC San Diego; Daizaburo Shizuka at the University of Nebraska, Lincoln; and Holly Copeland at the Nature Conservancy in Lander, Wyoming. The project is conducted in partnership with the U.S. Fish & Wildlife Service, Pinnacles National Park, Ventana Wildlife Society, Santa Barbara Zoo, and the Nature Conservancy.